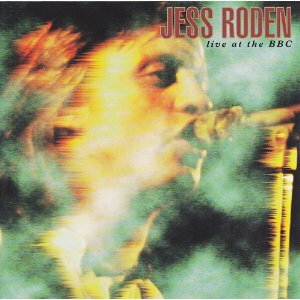 Live At The BBC is a live album of the Jess Roden Band live in concert in December 1976 from The Hippodrome, London with four extra live in the studio recordings from 1975. These were broadcast on the John Peel show and that’s where I first heard Jess Roden. In fact it might be the only place I’ve heard this great singer on the radio. I was thrilled when I found this album was released on CD in 1996 and I think it could be the best live album ever. A bold statement but I can’t tell you how many times I’ve played this CD. It’s a perfect mix of rock, soul, blues and funk. I adore it. I used to have a previous live album by Jess Roden called Blowin’ which I loved as an LP. Tracks 1-11 were recorded in December 1976 for the Radio 1 In Concert programme broadcast on 15.1.77. Tracks 12-15 were recorded for the John Peel Show in April 1975 and are live in the studio rather than in front of an audience. At this stage, the Jess Roden Band had only recorded these two albums so that inevitably means that the album is shorter than I’d want. This is one if those situations where this part of my review rating improves with the addition of the in session studio recordings but the album is then penalised in the third category, atmosphere and authenticity because it’s not all recorded live in concert. I love this album and I give it 10/10 for the songs on it. I don’t understand why the band didn’t get the success they deserved except that, by this stage, punk and new wave was dominating the music press. This is a full sound from such a large group but it’s always beautifully balanced as the group drift from blues to soul to funk. Jess Roden is one of my favourite male singers and he may even take the top spot. His material isn’t always as consistently good as it was with the Jess Roden Band so this is very much the high water mark. His studio albums around this time are very good but I don’t think they can stand comparison with his live recordings. The point the album gained from the inclusion of the in session songs is deducted here because we lose the live atmosphere in the final four songs although there is still an intensity of the recording. This is possibly my favourite live album although I love the live disk included in the Jess Roden box set Hidden Masters as well along with Blowin’ the first JRB album that I bought on vinyl back in 1977. It’s not perfect but I can’t imagine being without it. What Do You Think About Jess Roden Live At The BBC? If you’re lucky enough to have this album, what do you think about it? Unfortunately it doesn’t seem to be generally available at the moment but is a terrible shame. Second hand copies are very expensive. Jess Roden should have been a huge star. It’s difficult to find out much information about him but there is a website. Please help me to find the best live albums by voting in the readers polls. This album is included in two polls and I really believe it would be much higher rated if it was better known. This entry was posted in 1970s Live Albums, Blues Rock Live Albums, Rock n Roll and Early RnB Live Albums and tagged 1970s Blues Rock, 1976 live albums, 29, blues rock 1976, Jess Roden Live Albums, Live Blues & Blues Rock Albums With Saxophone by Paul Simister. Bookmark the permalink. This man must be recognised! Thanks Gavin. I’m always happy to hear more about Jess Roden although my preferred period is with the Jess Roden Band in ’76.